Get ready for the U.S. jobs report, the single most important economic release of the month. 1. Jobs report: The federal government is releasing its much-anticipated July employment report at 8:30 a.m. ET. Reaction to the report could move stocks and currency markets around the world. Analysts surveyed by CNNMoney expect the Labor Department will say that 216,000 new jobs were created last month. That would be a slight drop off from June when the economy added 223,000 jobs. But ultimately, anything over 200,000 is considered a "good" number, indicating a healthy economy. Experts expect the unemployment rate to stay steady at 5.3%. When it dropped to that level in June, it was the lowest rate since April 2008. Year-over-year wage growth is expected to increase to 2.1%, up from 2% in the last report. The Federal Reserve will keep a close eye on the new numbers. The central bank has been hinting at a rate increase for months, and a strong jobs report could clear the way for that hike to happen in September. 2. Stock slump: U.S. stock futures are holding steady ahead of the jobs report. 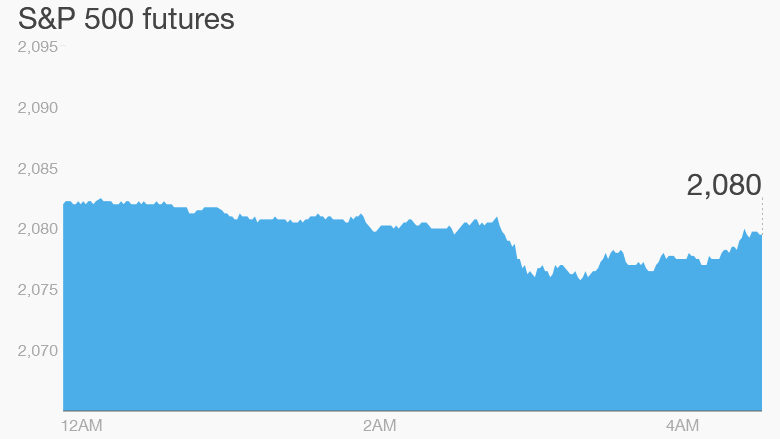 If the Dow Jones industrial average posts another fall Friday, that would mark the seventh consecutive trading day of declines. The Dow has dipped by 2.3% since the start of the year. But the S&P 500 and Nasdaq are still in positive territory over the same period. Asian markets ended with mixed results. Meanwhile, European markets are mostly declining in early trading. "Disappointing French and German industrial production figures, posted before European markets started trading, have ensured a dominance of red on trading screens," explained Alastair McCaig, a London-based market analyst at the broker IG. Greek markets are stabilizing after a week of heavy losses. 3. Market mover -- Nvidia: Shares in Nvidia (NVDA), a graphics company, are shooting up by about 10% premarket after the firm released better-than-expected earnings Thursday night. 4. Earnings: Quarterly earnings from companies including Hershey (HSY), Sotheby's (BID), Cablevision (CVC) and Groupon (GRPN) are coming out ahead of the open. After the close, Berkshire Hathaway (BRKB) will report results. The company -- led by billionaire Warren Buffett -- is the fourth largest company in the U.S. and has invested significantly in Kraft Heinz (KHC), Goldman Sachs (GS) and Coca-Cola (KO).